The Netherlands is a major international arms dealer. The export value since 2004 adds up to almost 15 billion euros. This business is great for the national economy, but it also creates risks as the Netherlands does not want these weapons to end up in the wrong hands. To assess these risks we started a collaboration with Bellingcat and the data-journalism team of KRO-NCRV. The premise of this collaboration was simple: to find out where the arms that are exported from the Netherlands actually end up. On top of preliminary research we organized the #DutchArms bootcamp. A fulltime two-week training and research project, set up with a dual goal in mind. First, to trace Dutch weapons exports across the globe and the check their deployment by end-users post-shipment. Second, to train journalists and reporters in the use of digital open sources, verification and geolocation. Between January 8 and 19, 2018, fifteen journalists joined in our own open source investigation lab. An intense, focused and productive period. Here's a story the Dutch TV-show Brandpunt+ made about it. Everyone was invited to join and to follow the investigations. The website www.dutcharms.nl served as a nearly real-time log of the progress made during the #DutchArms bootcamp. It now presents the findings of the twenty weapons deals that have been investigated. Some of these research leads led to revealing discoveries, some of them have not been completely closed, others proved too difficult to trace using only open source methods. Since these findings are relevant too, they have also been published. Open source investigation also leans heavily on participation from selected experts or the online 'crowd'. As the #DutchArms researchers investigated social media updates and online video, we used our networks to communicate about the project and invite those interested in the topic to help us. This social media content was published across Twitter, Facebook and YouTube, with the hashtag #DutchArms. An overview of all stories and publications can be found here. This production, published by our partners at KRO-NCRV data, includes all findings in one interactive story. Damen shipyards ignores proper licensing when exporting military goods to Libya, a country that is currently under weapons exports embargo. On a Dutch company's involvement with the US drones programme. Dutch-French technology company Thales produces communications and radar systems to be placed in Saudi-Arabian tanks. Howitzers formerly owned by the Dutch army have been spotted in Yemen as part of the United Arab Emirates' arsenal. YPR-765s, sold by the Netherlands to Turkey, are used by the Turkish army to fight Islamic State in the Sinai. 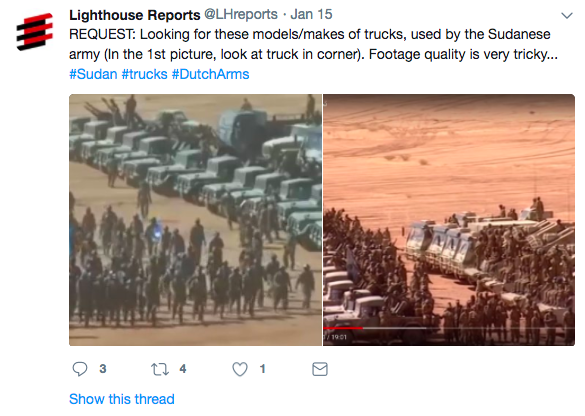 At least one of these armored vehicles has been captured by IS. Wat gebeurt er met onze wapens?